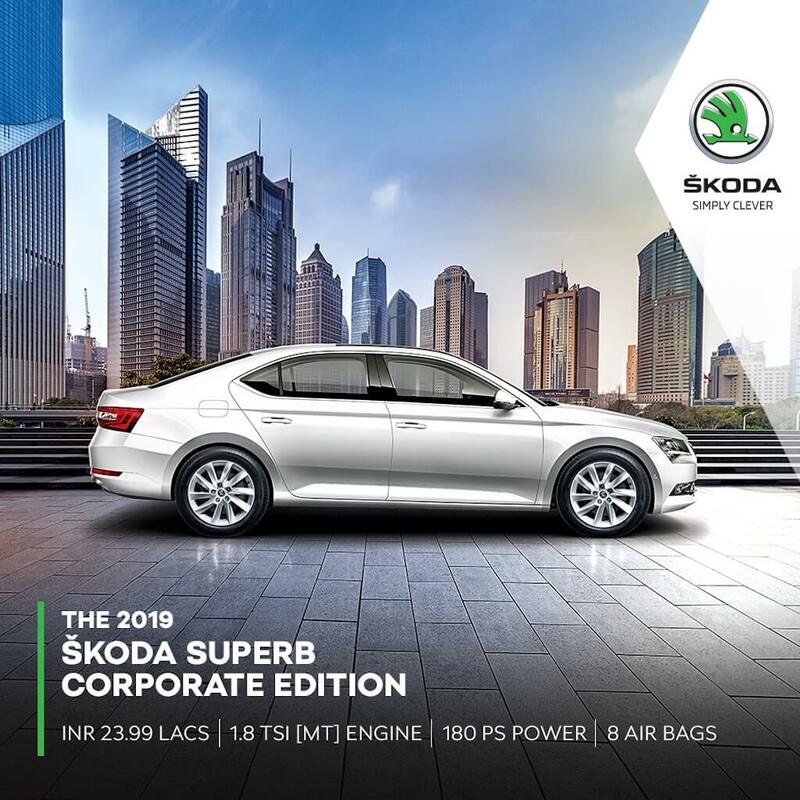 Skoda India has launched the 2019 Skoda Superb Corporate Edition at INR 23.99 lakhs. The Corporate edition will be offered only to existing Skoda customers. It is the affordable trim of Skoda`s flagship sedan in India. The Czech carmaker launched the Corporate Edition of the Superb in 2018 August last year, but it was available only in one colour – Candy White. However, the 2019 model gets a new Magnetic Brown shade. The Corporate Edition is the base variant in the Superb line-up. Equipment wise it is on par with the Style variant. Creature comforts include an 8.0-inch touchscreen system with support for Android Auto, Apple CarPlay and Mirror Link. Apart from this the car gets a three-zone climate control, humidity sensor and a cooled glove box. It also gets an app that controls the navigation, music and radio. Powering the car is a 1.8 litre 4-cylinder turbo charged petrol motor that generates 180 hp of power and 320 Nm of twisting force. It is paired to a 6-speed manual transmission. On the safety front the 2019 Superb Corporate Edition is equipped with ABS, ESC (electronic safety control) and 8 airbags. The Superb is available in two variants – Style and Laurin & Klement (L&K). The Style variant is available with a 1.8 litre petrol motor that pumps out 180 hp mated to a 7-speed AT or a 6-speed MT. The diesel unit is a 2.0 litre motor which produces 177 hp paired to a 6-speed dual clutch AT. The top of the line L&K variant gets the same engine options, but only with an automatic transmission. The Skoda Superb competes with the likes of the Honda Accord Hybrid and the Volkswagen Passat and the upcoming Camry Hybrid.